Starring the voices of Albert Brooks, Ellen DeGeneres, Alexander Gould, Willem Dafoe. Directed by Andrew Stanton and Lee Unkrich. A Walt Disney Production. 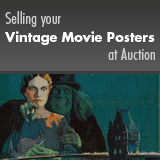 An unrestored poster with a clean overall appearance. It may have general signs of use, such as light edge wear, minor creases, very small tears. There is a soft horizontal crease in the upper image. Please see full-color, enlargeable image below for more details. Rolled, Very Fine+.